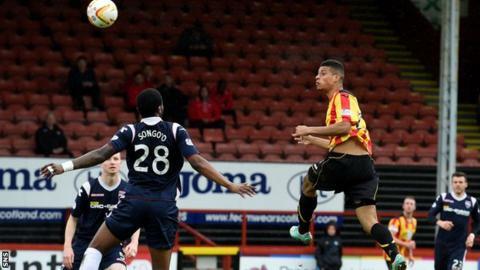 Partick Thistle manager Alan Archibald hopes to secure the services of striker Lyle Taylor on loan again next season. Taylor, on loan from Sheffield United, was on target in the 3-2 defeat at home by Ross County, a result that saw the Jags finish 10th in the Premiership. "It's down to Lyle's parent club, if he's made available again we'll try to get him," Archibald said. "Lyle has done very well, and one thing we've got in our favour is that I think he's enjoyed his time here." A 4-2 victory over Hearts on Wednesday meant Thistle went into the last game of the campaign in no danger of facing the relegation play-off. And Archibald has already been planning for next term. "We've started getting things moving now, with getting players extended contracts and trying to get some to stay on," he added. "We think Aaron Taylor-Sinclair is going, he's said all along he'd be moving on and he's been a credit to the club. We've had three good years out of Aaron so we wish him all the best. "There's always a lot to do, the ones we lost we need to replace and we need to go and build on it. It'll be even harder next season, we know that. We've not got Hearts with a points deduction, so we need to build on this season." Thistle found themselves 2-0 down on Saturday thanks to goals from Jordan Slew and Yoann Arquin, but Taylor and George Moncur hauled them level before Melvin de Leeuw won it for County. That meant the Staggies finished seventh, and Archibald could not hide his disappointment. "We had a chance to finish seventh, and we missed out on it, so it was a sore one to take," he said. "But our aim was to be safe in the league, and if someone had offered us 10th at the start of the season we would have grabbed it. We're delighted with that, but it's hard just now because I think everyone in the bottom half was desperate to finish seventh."